Good health is directly connected to good sleep, and poor quality of sleep and not enough sleep can have negative effects on health. This is especially true for seniors who commonly experience sleep disorders, take medications, and have chronic health issues like heart disease and diabetes, among other conditions — all of which can impact sleep. According to the National Sleep Foundation (NSF), more than 44 percent of seniors experience one or more symptoms of insomnia at least a few nights during the week. The NSF also reports that snoring alone is a common sleep disruption for more than 90 million American adults. Sleep patterns change with age, and are also referred to as “sleep architecture.” Sleep patterns for the elderly cause sleep to become lighter with more frequent waking up during the night. Why is sleep important for seniors? Sleep requirements are different from person to person, and the Center for Disease Control (CDC) recommends 7-9 hours of sleep for adults over 61-64 years old and 7-8 hours of sleep for adults 65 and older. 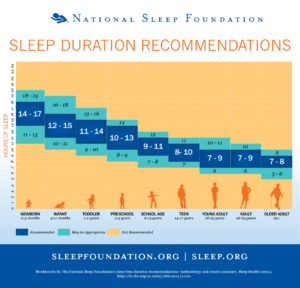 This infographic from the National Sleep Foundation shows how sleep changes throughout a person’s life span. Both the amount of sleep and quality of sleep are important factors that contribute to overall health and well-being, including memory, mood, and weight. Healthy sleep also helps reduce the risk of accidents and allows the body to rest and heal. Insufficient sleep can cause weight gain, and good sleep helps people maintain a healthy weight. Poor sleep is also known to cause a lack of motivation to be active. Difficulty falling asleep and sleep disturbances can prevent a good night’s sleep, which can cause more accidents or falls, mood problems, depression, depression, and anxiety. Signs of poor sleep include an increase in the time it takes to fall asleep, less REM sleep and slow-wave sleep, and frequent waking up during the night. 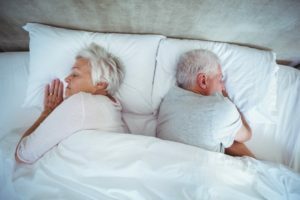 Sleep can also affect memory, and the National Institute of Health reports that this connection may help explain why seniors are often forgetful. As people age, the brain deteriorates, and changes in sleep patterns result in less slow-wave activity, which is important for memory performance. As sleep deteriorates with age, memories are more difficult for the brain to store during nighttime sleep. Physical changes occur as people age, and have a direct impact on sleep. Some sleep issues are directly related to aging, while other issues seniors experience are not age specific, and could be experienced by people in other age groups. In addition, sleep needs change based on gender, genetics, a person’s internal clock, quality of sleep, and recent lack of sleep, according to WebMD. Sleep problems are a reality for 40 percent of the elderly, and can include everything from frequent waking up during the night, to daytime fatigue, to irritability and light sleep. Many of the sleep problems are due to aging and the changes that occur in sleep patterns — causing more frequent waking up and lighter sleep. Many times, seniors experience extreme daytime fatigue which can prevent them from participating in normal activities. With much of the elderly population reporting poor sleep, a relatively small percentage of seniors have diagnosed sleep disorders and are prescribed sleep medications. In this part of the guide, we will explore the different kinds of senior sleep disorders and problems, plus possible treatments. Insomnia is defined as difficulty staying asleep or falling asleep. People with insomnia have symptoms including poor moods, fatigue, and low energy, and also have a hard time concentrating and performing regular daily tasks. The effects of insomnia can take a toll on overall health and well-being. The National Sleep Foundation reported that a poll showed that nearly 40 percent of older people were more likely to wake up a lot at night as compared to younger people. Psychological treatments include a positive and consistent sleep routine or hygiene; and therapies like cognitive-behavioral, sleep restriction and stimulus control; and relaxation techniques like breathing exercises, meditation, and guided imagery, among others. Medications that aid sleep are either non-prescription or prescription medications. Prescriptions drugs include benzodiazepines, non-benzodiazepines, and antihistamines. Before seeking treatment for insomnia, it is recommended that seniors consult with their doctor. Medications prescribed or recommended may vary based on symptoms of insomnia. Alternative treatments can include herbal supplements like melatonin, valerian root, or chamomile; physical exercise; acupuncture, yoga, massage, and relaxation techniques. Sleep apnea is a sleep disorder in which breathing stops and begins again during sleep. This stopping and starting can sometimes occur hundreds of times each night. Sleep apnea can be caused by blockage of the throat airway or because the brain fails to signal muscles to breathe. Sleep apnea can result in a decrease in the amount of oxygen a person gets. Symptoms include snoring, gasping for air, headaches, and daytime sleepiness, among others. Sleep apnea affects between 13 and 32 percent of older adults who are 65 or older, according to this study. In fact, 22 million Americans suffer from sleep apnea. Learn more from our sleep apnea guide. Sleep studies monitor sleep by observing heart rate, sleep state, eye movement, muscle activity, oxygen levels, and airflow, among other functions. These studies are conducted to help diagnose sleep apnea and inform the treatment plan and severity of the disorder. Continuous positive airway pressure device, also known as CPAP, is a mask designed to fit over the nose and mouth. It provides a gentle airflow to promote the airway to stay open during the night and sleep. This treatment is highly recommended and effective. Lifestyle changes are also recommended for those with sleep apnea. Losing weight, quitting smoking, changing sleep positions, and avoiding alcohol may help reduce sleep apnea. Dental devices and surgeries are also options for sleepers with sleep apnea. These appliances help restructure the positioning of the tongue and lower jaw to promote more consistent and open airflow. There are also some surgeries that can be performed to remove tissue in the airway, for example. Narcolepsy is a neurological sleep condition that causes a person to fall asleep very suddenly at any time without advance notice, as well as excessive daytime sleepiness. This could happen while performing regular activities, like working or driving, and can be dangerous. This condition launches sleepers into deep REM state sleep (dream-stage sleep) in about 10 minutes, as compared to the regular 90 minute timeframe it takes to reach REM sleep. A less severe condition related to narcolepsy is hypersomnia, which causes chronic sleepiness even if a sleeper has gotten enough sleep the night before. Narcolepsy affects 1 in every 2,000 people in the U.S, which is about 200,000 Americans and 3 million across the world. Learn more about narcolepsy in our guide to narcolepsy. Medications like amphetamine-like stimulants that help keep the body awake; antidepressant drugs; and a drug called Xyrem that is designed to promote better sleep at night to reduce sleepiness during the day. Lifestyle adjustments can help people with narcolepsy, and include avoiding alcohol, nicotine and caffeine; and implementing a regular sleep routine including a consistent nap schedule, exercise, and healthy eating. Support and support groups are also important for those who suffer from narcolepsy. Talking to people you know about your condition is key to your safety. Restless leg syndrome (RLS) is a disorder that causes people to have an uncontrollable urge to move their legs during rest. The condition interferes with sleep, and can also occur when people are sitting for long periods of time. In addition to the urge to move the legs, people also experience a crawling or itching feeling in their legs. This study reports that RLS increases with age, and older adults experience the condition more — with rates between 9 to 20 percent. In addition, women are affected by the condition twice as often as men. Similar to RLS, periodic limb movement disorder (PLMD) is when movements are involuntary and cause jerking or twitching, and tightening or flexing of muscles. This disorder also increases with age. Medications for RLS include drugs that increase dopamine in the brain, affect calcium channels, opioids or narcotics, muscle relaxants, and sleep aids. Lifestyle changes also help treat RLS. Using heat or cold packs and taking warm baths and massaging legs may help soothe the muscles and reduce sensation. Relaxation activities like yoga or meditation can help relax seniors before bedtime. A good sleep routine with consistent bedtime and a healthy sleep environment is important for RLS. Exercise can help relieve symptoms, and people with RLS should avoid caffeine. Snoring is a harsh or hoarse sound that happens when breathing is obstructed or strained, and can cause sleep to be disturbed. It happens when the tissue in the throat vibrates as air flows by, causing an annoying sound. Snoring can also mean a person may have a more serious disorder, and can cause daytime sleepiness; trouble with concentration; mood or behavior issues, like anger; and an increased risk of high blood pressure, stroke, and heart conditions. The National Sleep Foundation reports snoring is an issue for 90 million adults, and for 37 million of those adults, snoring is regular. Lifestyle changes include losing weight to promote easier airflow in the throat; sleep position training; proper allergy treatment; and avoiding alcohol. Surgery is also an option, and is performed on the back of the throat and roof of the mouth, or even the nose. Dental devices are usually constructed by dentists who are experts in treating sleep apnea and snoring. There are also appliances called nasal dilators. Continuous positive airway pressure device, also known as CPAP, is a mask designed to fit over the nose and mouth. It provides a gentle airflow to promote the airway to stay open during the night and sleep. This treatment is highly recommended and effective, and prevents the airway from collapsing. People with excessive sleepiness may feel fatigued, irritable, moody, and have trouble concentrating. Lifestyle changes include a healthy sleep routine and environment and stress management. Continuous positive airway pressure device, also known as CPAP, is a positive approach for those with sleep apnea who experience excessive sleepiness. The mask is designed to fit over the nose and mouth and provides a gentle airflow to promote the airway to stay open during the night and sleep. This treatment is highly recommended and effective, and prevents the airway from collapsing. Medications that promote wakefulness and improved sleep may be used, and can include stimulants. If seniors don’t move very much and are mostly sedentary, it is common for them to feel wakeful instead of sleepy. Regular physical activity during the daytime expends energy and can help promote good sleep. Sleep disorders like RLS, snoring, or sleep apnea are more common for seniors. The sun can help seniors differentiate day and night and also helps regulate melatonin. Older adults can use a light therapy box, keep shades open during the day, or spend time outside. Chronic pain, including osteoarthritis, may keep seniors up at night due to the nagging nature of the ongoing pain. Women may experience hot flashes and sweating at night that can interrupt sleep and cause sleep problems. Disorders like Alzheimer’s and Parkinson’s contribute to sleep problems, and insomnia specifically is very common among seniors with these conditions. Side effects of some medications can impact sleep for seniors. Inconsistent sleep routines and an unhealthy sleep environment can cause sleep problems. Healthy sleep routines include consistent bedtimes, no daytime napping, and the right mattress, among others. Napping during the day can prevent seniors from feeling sleepy before bed, and can contribute to sleep problems. Heart and lung conditions, especially, can affect breathing, which can have a negative impact on sleep. These also include heart failure and chronic obstructive pulmonary disease. Getting up to go to the bathroom at night can disrupt sleep for seniors. This can be caused by drinking too much water too late at night, or other conditions like an enlarged prostate or an overactive bladder. Heartburn symptoms can keep elderly people up at night, and can be caused by diet and eating big meals too late at night. Extreme worry, anxiety, or depression can prevent seniors from sleeping and may cause sleep disturbances. Creating a healthy sleep routine is key for seniors in getting quality sleep. A sleep routine includes everything from your daily diet and exercise, to your mattress and pillow, to your bedtime. Your pillow, mattress, and bedding are key in creating a healthy and comfortable environment for sleep, and foundational to your sleep routine. See our guides for details on the best kind of mattress for each kind of sleeper (back, side, stomach, combination), and check our mattress reviews to learn more about different mattresses on the market. A sleep diary will help you document your daily habits, and can help you track your bedtime routine so you can remember and evaluate when you wake up, dream, or when your sleep is disturbed. The National Sleep Foundation offers a free diary template online. For some seniors, a poor diet may be linked to a loss of taste, loss of smell, dental problems, depression, or a decrease in appetite. A healthy diet is essential in getting the right amount of vitamins and nutrients, and impacts overall well-being and sleep. Seniors may want to consider supplementing with liquid nutrition and vitamins. Physical activity is important for all people, and especially seniors. 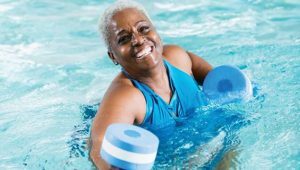 Staying physically active can not only prevent some chronic health conditions, but it also helps seniors reduce weight gain, which can lead to several senior sleep problems. Exercise also helps seniors burn energy and feel more tired at the end of the day. Stimulants like nicotine and caffeine impede sleep, keeping seniors awake. Both nicotine and caffeine can keep people up at night in addition to causing insomnia, less sleep, and withdrawal. Cutting back or avoiding both stimulants all together will help promote healthier sleep. Avoiding alcohol or limiting it to no more than half a glass is recommended to not interfere with healthy sleep. The old concept of having a “night cap” before bed does not result in better sleep, rather sleep becomes more disrupted because sleep patterns are affected by alcohol. Daytime napping may prevent seniors from getting to bed and getting a good night’s rest. Naps can increase the symptoms linked to insomnia, which can cause seniors to be irritable and have a difficult time concentrating. Exposure to the lights of the screen of a TV, phone, or tablet will promote a wakeful feeling. To promote healthier, more restful sleep, it’s important for seniors to limit screen time before bed, and to avoid screen time while in bed. Consider these top tips for seniors for getting healthier sleep. These tips can also help seniors with common issues that may prevent healthy sleep, like anxiety, worry, and excess energy, among others. Pick the right pillows and mattress for your preferred sleeping position. The Mayo Clinic provides information specific to sleeping pills, and recommends the best way to determine what’s right for you. The Mayo Clinic is a highly trusted resource. WebMD recommends natural sleep aids and remedies, and details effectiveness and risks for each aid or remedy. This Huffington Post article highlights 13 top natural ways to fall asleep faster. The article attributes much of its information to doctors and credible sources. Consider these helpful “Tips to Help You Fall Asleep” from the National Institute on Aging. Check out our guide on sleep disorders to learn more about each disorder, including symptoms and additional resources. The National Sleep Foundation offers industry-leading content about sleep disorders that are common for seniors. This web page offers several different categories of sleep disorders and problems. The American Academy of Family Physicians explores normal sleep, changes in sleep due to aging, and sleep disorders and treatments for seniors. National Institutes of Health details sleep disorders and potential causes of sleep disturbance. The UCLA Sleep Center website offers a wealth of information in its “Patient Education” section about how sleep changes as people age and ways to improve sleep. This study explores “Normal and Abnormal Sleep in the Elderly” and sleep disorders, plus possible treatment options. Addressing sleep over an entire lifespan, this study explores changes in sleep due to aging and confirms an increase in sleep latency and a decrease in slow-wave sleep that is common for seniors. This study shows that older adults with low sleep efficiency have double the risk of mortality, and explores the long-term effects of poor sleep on overall health. This WebMD article is written by a doctor who details simple ways, including behavioral changes, to address sleep issues that are common for seniors. Harvard University’s Healthy Sleep website details changes in sleep as people age, and includes a video that talks about the importance of paying close attention to healthy sleep habits with age to balance biological changes. Familydoctor.org addresses lifestyle habits that can impact sleep and recommended habits for getting better, healthier sleep. The National Sleep Foundation gives advice on how to cope with sleep issues. The American Psychological Association provides an “Older Adults and Insomnia Resource Guide” that includes a section with organizations to explore for additional information. There are insomnia online support groups, including https://insomnia.supportgroups.com/, http://www.insomnialand.com/forum/, https://www.agingcare.com/sleep-disorders where you can submit questions. AARP has a tool specific for finding support groups for caregivers, along with an online chat tool.